All three initial teasers have had a title drop track that reflects core themes and characters. TFA's had an exciting version of the Star Wars main theme, TLJ had a dark, ominous version of Luke's Force theme and now this one has a hopeful, heroic take on Kylo's. It's thematically relevant only given what we know about past marketing teasers. Turns out I misinterpreted what Chuck said earlier today. 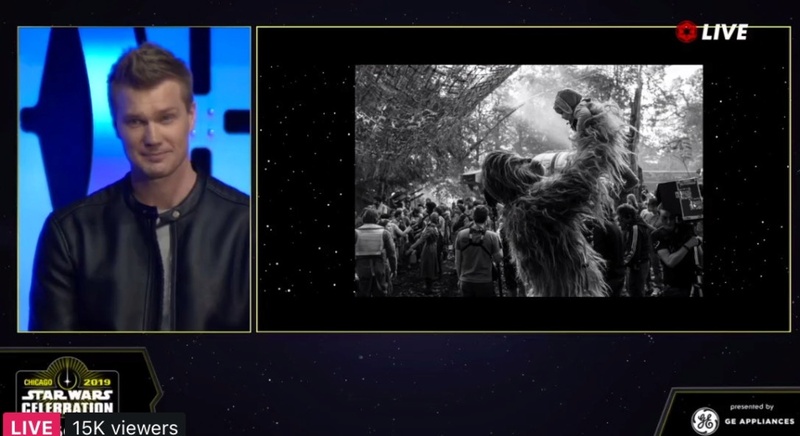 He said it reminds him of his Aftermath books, not that it conflicts with them. Those were the books that had the Palpatine stuff in them. Referencing the pic of Joonas(dressed as Chewy) holding his son, I commented this and he responded with a laugh. Joonas has done a wonderful job fitting into Peter's very big shoes; his transition is so seamless you can't tell one from the other inside those suits. 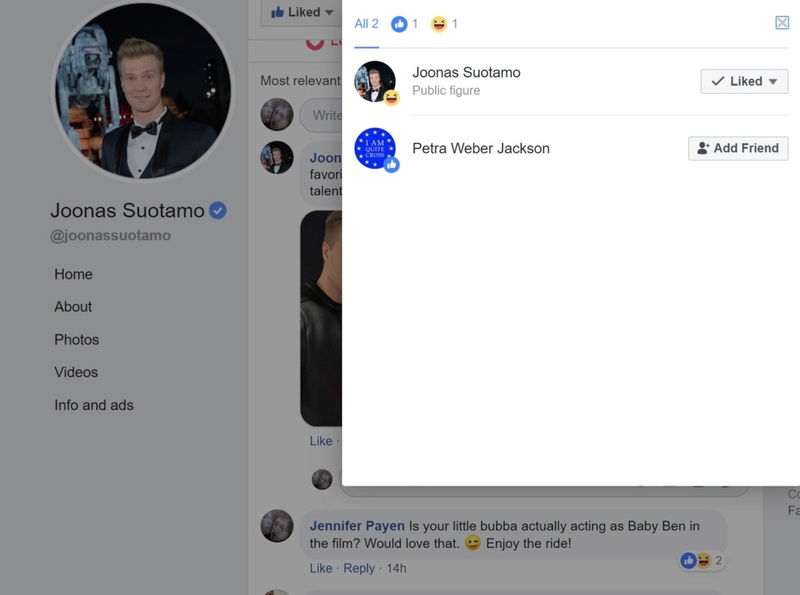 Maybe not in the movie, but I wonder if Joonas's son wasn't the source of the fake leaks we've had about a reylo baby in 2018. Can we think that they shot scenes together? the rise of skywalker in my opinion calls all the skywalkers and not just one in particular. I am of the mind that we will see all the skywalkers next to Rey and Ben. 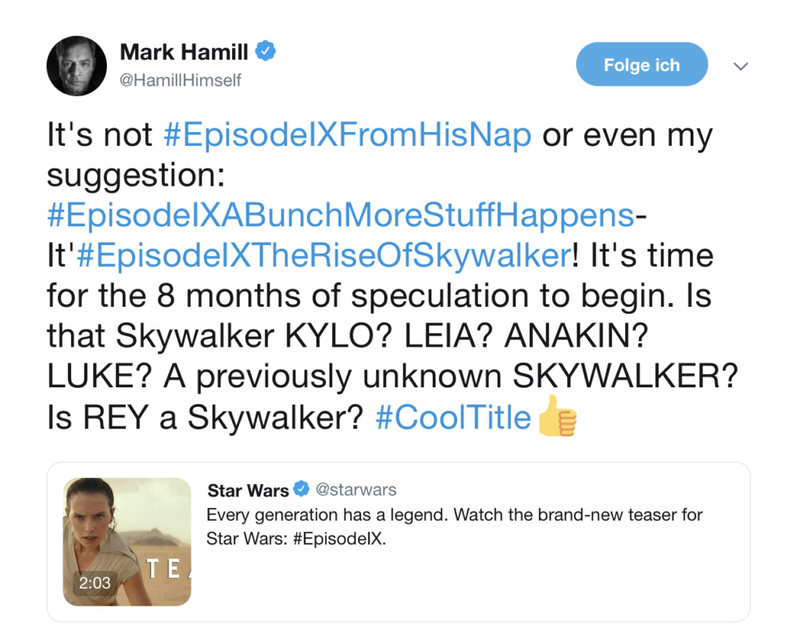 Ben is a Solo but he is "the skywalker "in this new trilogy, Leia is a Skywalker but carries the surname Organa, but 100% she is a Skywalker, Luke is a 100% Skywalker but we will see him as force ghost, however Yoda in force ghost checked for lightning, so could I assume we will see luke do similar things like yoda? finally there is Rey, she doesn't have Skywalker's blood but she could inherit the surname. I can't wait to see what this last chapter has to offer us. OMG, Sad Kylo Ren! 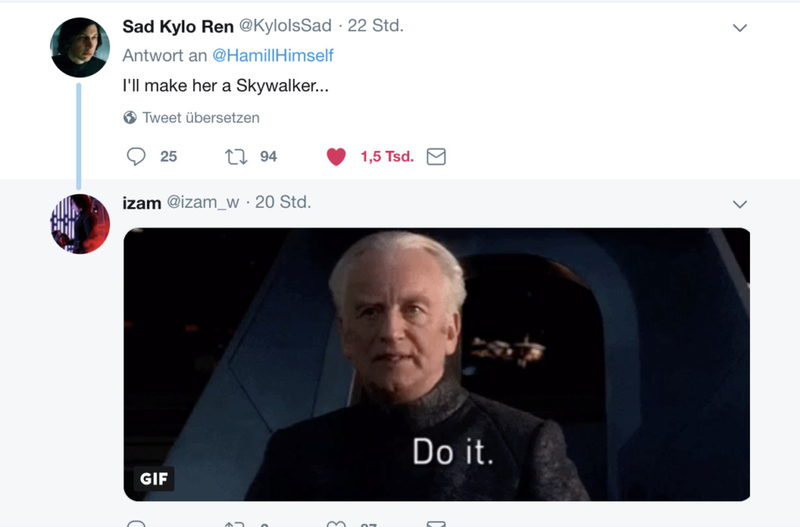 What he says about the Rose and Rey pic. Ugh, I'd been thinking the same thing. They took the gas station attendant costume from Leia and gave it to Rose. Agree. I believe that the full title should have been The Rise of Skywalker name/family/bloodline in reference to all Skywalkers if they wanted a title that gives everything away Joke aside, I really love the title they chose. 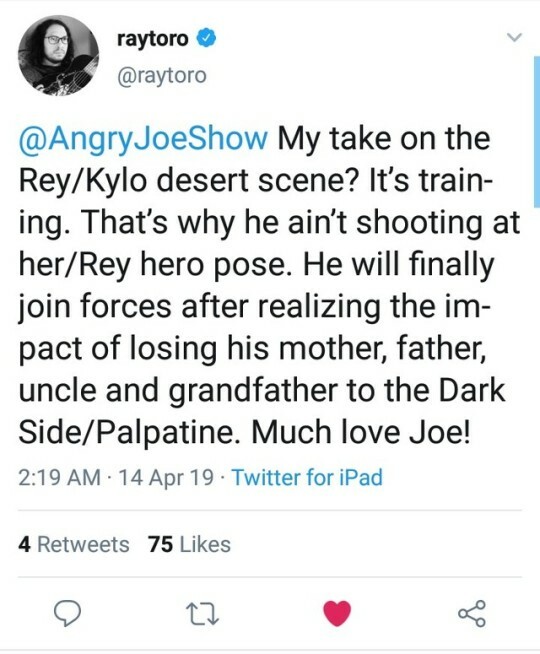 Get the feeling that it will tie everything from the origins of that story and conclude it beautifully (maybe with Reylo babies who knows?). Here's a thread of the cast on the interview carpet yesterday from the SW account. I'm just putting it here because everyone looks pretty and happy. 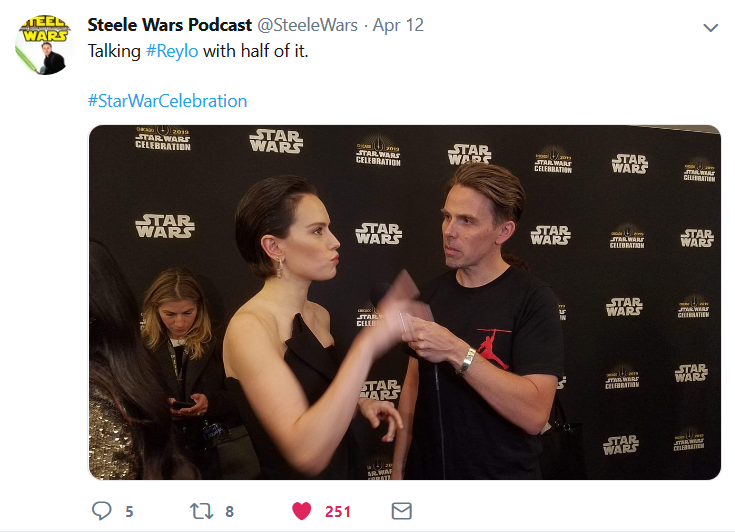 Steele Wars is in one of the pictures, and he also posted this. He's friends with Courtney of Knights of Rant too. Looks interesting. Do we know when he'll release the video? Ray Toro from My Chemical Romance basically supports REYLO guys!!! I'm still not entirely convinced that it's training, I need some more information but what he wrote intrigued me. It's true kylo could shoot her with his ship. !!!!!! Have y'all seen Free Umbrella Academy?! It's written by Gerard Way of My Chemical Romance. The whole way through the show it reminded me of Kylo. I was thinking wow this is basically the Kylo prequel we need, HOW he became who he is. You gain a lot of empathy when you see it all unfold. It's so deeply tragic and heartbreaking and frustrating. I was super impressed actually by Way's understanding of trauma and how it shapes you, he is super deep and it's nice to see his co-mates have that too. I don't know why this is so hard for TLJ haters to understand. 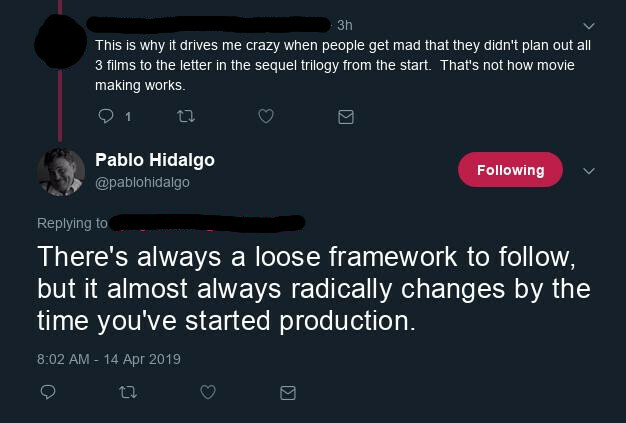 I've heard a couple of complaints from them that people from LF are contradicting themselves and lying, because they have said that Rian Johnson was given free rein over TLJ and that Palpatine's return was planned all along. It is almost as if Star Wars has told us this many times and people still won’t listen. 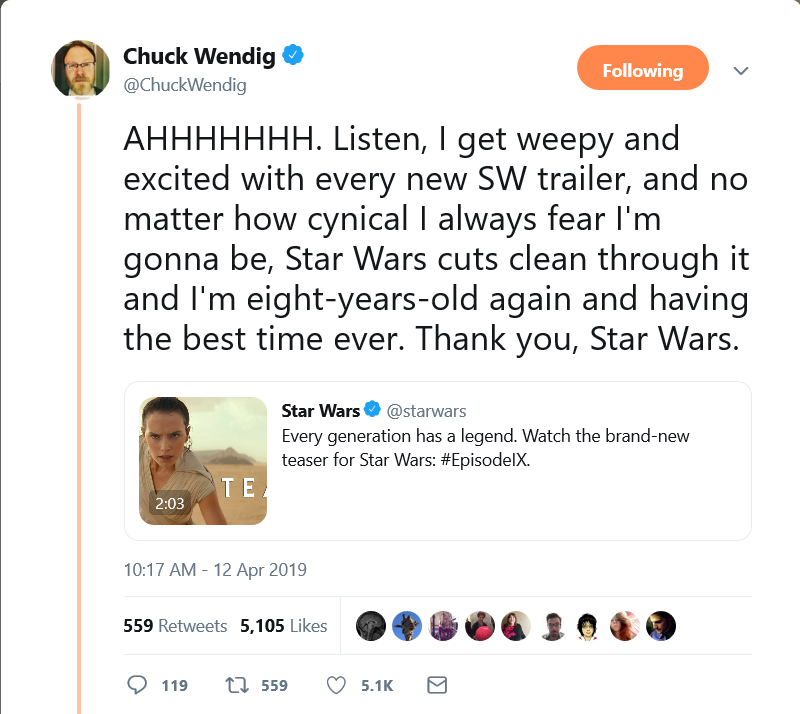 Right, I think that when they approached the future story they probably had in mind what they want to tell - a story about hope and redemption, new generation and their life with the legacy of the previous generations, the democracy of the force etc. Also a young girl with force powers, the wayward son of the heroes gets redeemed, romance, Palpatine returns etc. All of this is quite enough to give the overall message but in general they are just bullet points and there are a lot of blank spaces to fill as how to get there. ahahah Daisy she said , she said!!!!!!!! Thank you for putting this one, I'll add it to my signature.